Four kids, a mini-van and a lot of love: Last October GIVEAWAY-Seams Sew Sweet! Last October GIVEAWAY-Seams Sew Sweet! I got the chance to review Seams Sew Sweet Etsy shop. What a great shop! 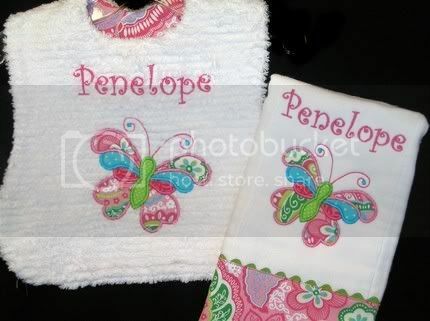 Cindi has amazing talent with embroidering and designing baby things. She even makes clothes! Wow, I hope you are as impressed as I am! 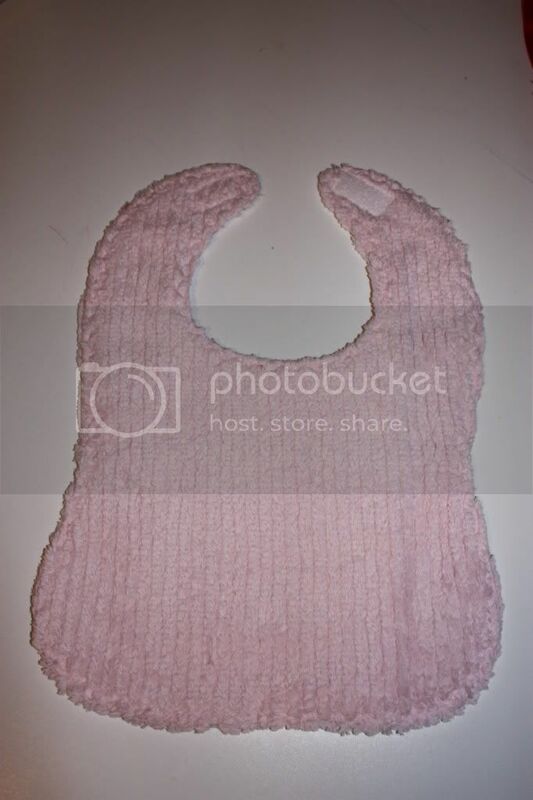 These bibs are just like ones I have bough in boutiques, with the chenille backing! They are made very well and still stay soft after they are washed. 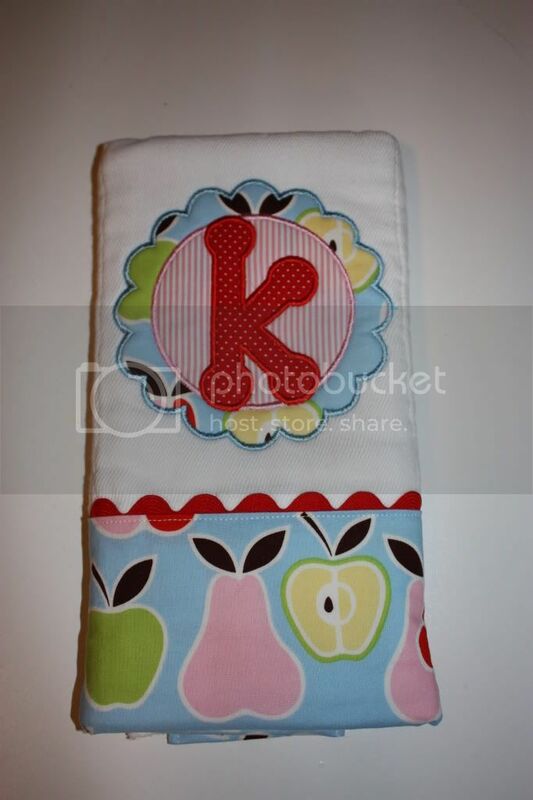 The matching burp cloth is great too, it is almost too cute to let a baby spit up on. She can personalize all of her items, which I just love. Cindi is offering one of my readers a $25.00 git certificate to her Etsy shop Seams Sew Sweet. All you have to do is go over to her shop, then come back and leave a comment, telling me what your favorite item is. 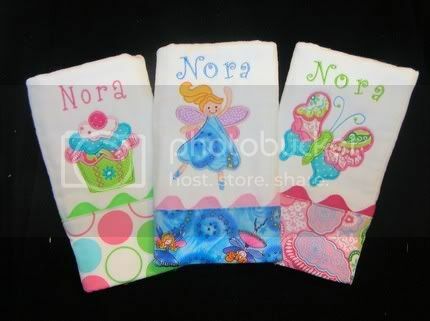 4 extra entries- Buy something from Seams Sew Sweet and leave me a comment telling me what you bought. *If you don't have a blog, you can still leave me a comment to win, just make sure to include an e-mail address. This giveaway will end on Friday November 6th and the winner will be chosen with random.org and then announced on the 7th. Good Luck!! I grabbed your button-it is on my blog on the left side! I also tried to follow your blog, but my computer won't let me right now. All well! The A-line dresses are beautiful! OMG, the clouds one is too precious. But I would SO need that bagels and cream cheese bib. For friends, family, and us, if we have a baby #2 someday! 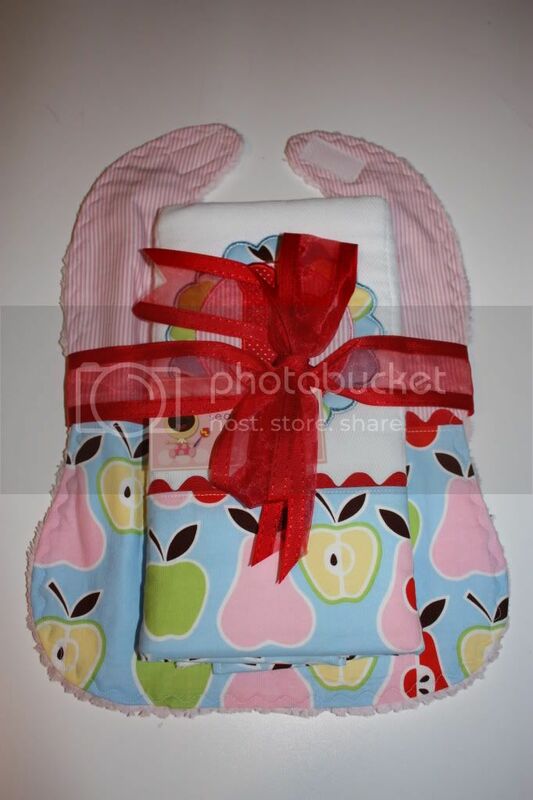 I love the pirate bib and burp cloth set! How cute!! I just got your comment on my blog... thanks for stopping by! I am excited to enter the contest! I LOVE the elephants at play burp cloth and bib! Parker's room is safari themed and I am out of control with the safari animals! And now I follow your blog! You have such a cute family! Congrats on your pregnancy as well! Exciting!!! 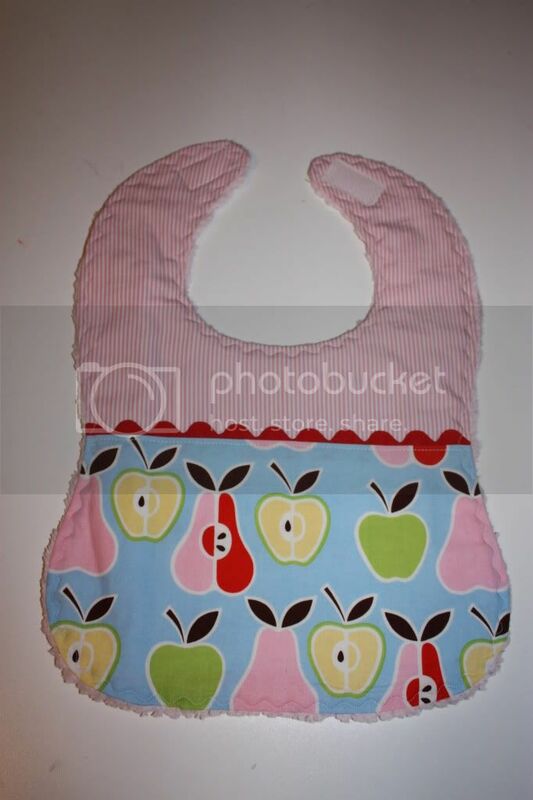 I LOVE the whimsical tree pattern on the bibs! You always have such great giveaways! 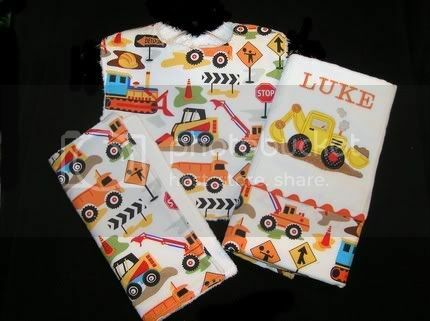 The construction bib/burp cloth set is too cute! Sadly my girls are past the bib and burp cloth stage, but I love the "blew by you" dress! Yea-my computer let me follow you!! I love the Rudolph shortall! I love the Mums the word A-line Dress! So adorable!!! My favorite has to be the cherry gift set. 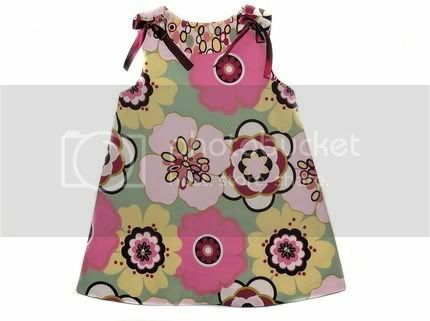 The lily pond girls a line dress is very cute! 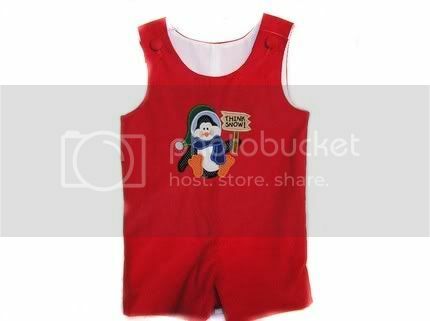 I love the you're a hoot owl bib...too cute!! 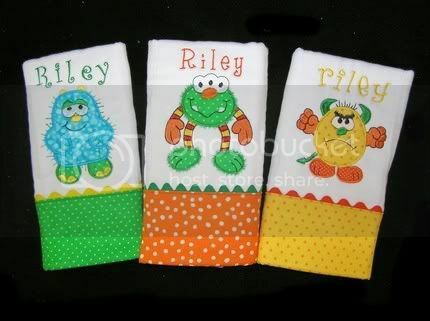 I love the Elephants at Play - Applique Burp Cloth - Chenille Bib - Wash Cloth - Personalized! So so cute!